Elevate Knives Carousel Set with Rotating Knife Block - 6-Piece - by Joseph Joseph (JJKNIVES) at Pure Design / Accessories / Kitchen ::: Furniture for the Home, Office, Home Office, and More at Pure Design Online! 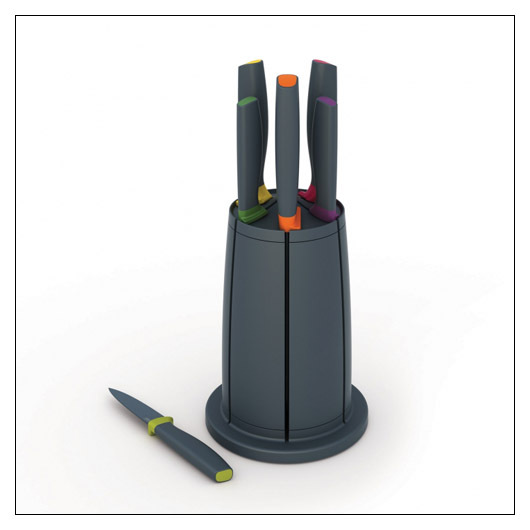 The Elevate Knives Carousel Set is extremely sturdy with a non-slip base and universal, magnetic knife slots that hold the knives securely in place when stored. Improves hygiene and reduces mess. These new Elevate(tm) Knives are all made from stainless steel and have non-stick, silicone-coated blades and comfortable, ergonomic handles. Sorry, this product is not available until TBD. Please call 800-483-5643 if you would like to pre-order this item.